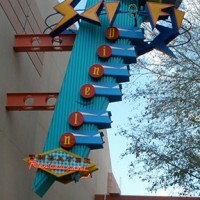 Disney is testing a new FASTPASS type system for dining reservations. In a way, this almost turns a dine-in restaurant into a quick service restaurant. It allows you to pick a time, order your food and, when you arrive, you are allowed right into the dining room and your food is delivered to your table. They tested this briefly at Be Our Guest and said it was a big success. This is not the big news, though. 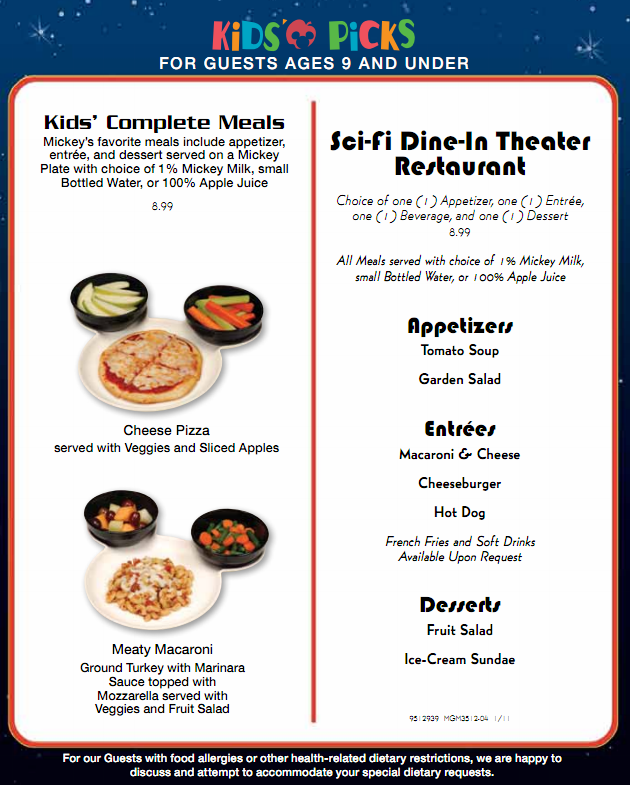 Back in February of 2012, Disney tested interactive menus at the Hollywood Brown Derby in Hollywood Studios. And, if you specified a food allergy, the menu eliminated those foods that contained your allergen. This was very limiting for some diners. In the end, if you had a food allergy, you would speak to chef as normal, which was much more reassuring anyway. The interactive menu simply presented some options to make you aware of the options the chef might offer. So, the new system may be a combination of the “FASTPASS dining” and the interactive menu, with one key difference; instead of removing the menu items that contain your food allergen, it can keep those items with ingredient substitutions. This is much better than the Brown Derby test since it gives you even more options. 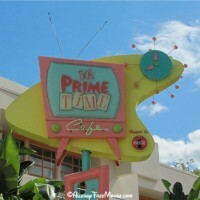 However, like the Brown Derby scenario, you will still speak to a chef, which is the protocol for all dine-in restaurants. According to the food service manager we spoke to, this is still very preliminary and is about to begin testing, along with many new automation options, like FASTPASS+, testing now. We can’t wait to give it a try! Let us know if you get to participate. UPDATE: After a Facebook comment, I thought I should clarify one point. In the BOG test, you had the option to order your food ahead of time if you knew exactly what you wanted. It wasn’t a requirement of the service. The reservation priority is a big seller since, especially at BOG, there has been quite a wait, even with a reservation time. 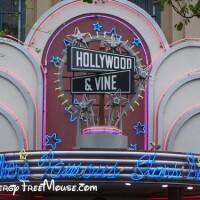 Below are food allergy restaurant reviews for the Disney’s Hollywood Studios. If you don’t see one that you’re looking for, please contact us and we’ll find more information for you. 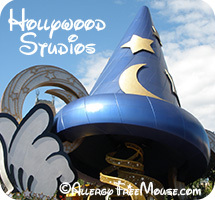 If you would like to contribute a Hollywood Studios food allergy-free dining experience, we would love to share it with our readers. Every shared experience helps the next reader. 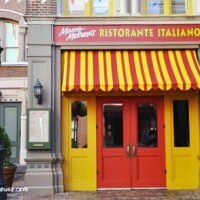 This is my favorite Italian restaurant in all of Disney World. I loved it so much that we ate there twice on our last visit. I had a wonderful vegetarian minestrone soup and a cheese pizza. For my daughter, who has a dairy allergy, Chef Julie prepared a wonderful salad with fresh pear and a tasty dried cherry vinaigrette dressing. She also had the option of having vine-ripened tomatoes with balsamic and basil scented olive oil along with fresh sweet basil leaves. After her salad, she had spaghetti with marinara sauce as her entrée. She loved it! 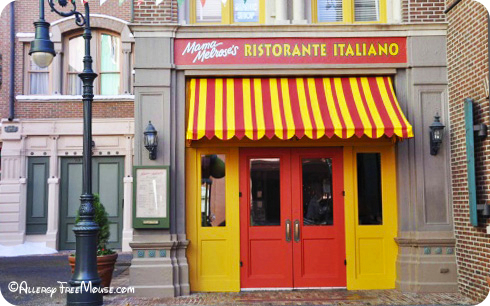 At many other restaurants, pasta marinara is an option, but it’s not memorable. Mama Melrose’s is now her favorite, too. Chef Julie and our server, Holly, were so accommodating and listened carefully to our daughter. Chef Julie made her salad with what she liked and, literally, went out of her way for her dessert — she had to go to another restaurant to get Enjoy Life cookies. She even asked what flavor of cookies she wanted. Chef Julie went above and beyond — a true testament to Disney’s commitment to food allergies. We ate here in May, when it was very hot. Mama Melrose’s was an oasis of great food, great drinks and cool air conditioning! It was such a wonderful experience. Incidentally, it was also Star Wars Weekends at Disney, so we dined with a few out-of-this-world guests. 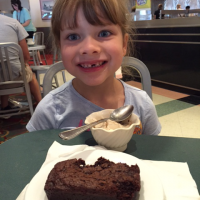 BabyCakes NYC in Downtown Disney Delivers…Cakes!!! This is exciting news! We had a tradition (OK, for 2 trips) to have a dairy-free cake delivered to 1900 Park Fare or Cinderella’s Royal Table for our little Princess, early in our trip. She would enjoy that cake at the hotel for the rest of the week. 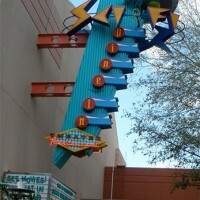 Then, along came BabyCakes NYC to Downtown Disney, and everything changed. It became our first and last stops of the trip. Now, BabyCakes NYC can deliver cakes to Disney World, offering the best of two already great options. Having a cake delivered to a dining event is already truly exciting for a child with food allergies. And our friends at BabyCakes NYC have the most delicious allergen-friendly and vegan baked goods on the planet. Therefore, having a BabyCakes NYC cake delivered to a Disney dining event has to be just as exciting as dining with Mickey Mouse or the entire Disney Princess Royal Family. At least, for a child with food allergies, it ranks right up there. BabyCakes NYC offers a 6″ round cake (serves 8-10) in a number of different flavors including: Vanilla, Chocolate, Carrot, Lemon, Brownie, Blondie, Banana, and Pumpkin. And they can also write personalized inscriptions, too! Guests can place their cake orders by calling the bakery directly (407.938.9044). They just need to have their reservation date, time, and confirmation number handy. BabyCakes NYC asks for at least one week notice for these orders, but the earlier the better! We can hardly wait until our next trip to bring back this tradition. Of course, we’ll still have to stop in at BabyCakes NYC upon arrival in Orlando! We have another guest review from Tara Wolfe who shared her son’s dining experience with multiple food allergies. Kevin is allergic to milk, eggs, peanuts, all tree nuts and coconuts. Sci-Fi Dine-In….what a neat place to eat! Tucked in the back area of Hollywood Studios, this is a unique place. At first, I was a little concerned in eating here, since it seems they serve ice cream with everything, and my son is anaphylactic to milk. But once you see the inside, you have to try it. 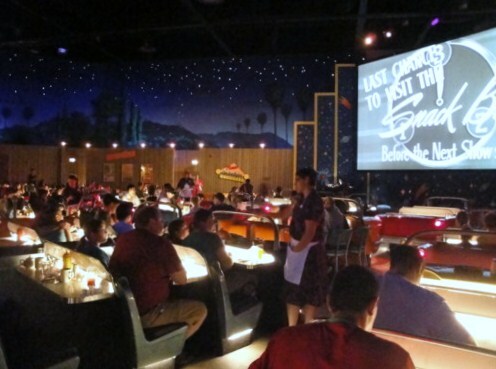 It really feels like you are dining in an old drive in movie theater. The past few years, we were lucky enough to get to eat in a nice car too. And the chefs here really know how to handle food allergies. When the chef came to our table, he made our waitress clean the table again, with a new clean towel so that there would be no cross contamination. 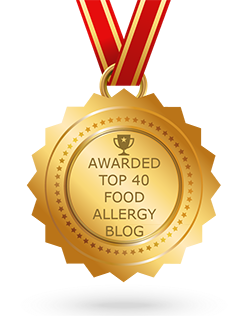 As for food choices with food allergies, there is not much to choose from. It’s basically a hamburger. But since we hadn’t eaten any the whole trip, a hamburger actually sounded like a real treat! My husband opted for a loaded Picnic hamburger, complete with a hot dog and tons of other stuff on top! He said it was good, just a little too much (especially since we had Fast Passes for Rock-n-Roller coaster right after). I went for a burger too. It wasn’t the best burger in the world. But sitting in that car with my son, watching B movies while he ate a safe burger with fries and laughed at Donald running across the screen, it was all worth it. But the best part…..when the chef came out and offered to make my son his first ever, store bought, milk free milk shake. He loved it, we loved it. Just make sure you have reservations. Even with reservations, we still had to wait almost an hour. Especially if it rains, this place gets packed quick. As for advice on how to dine safely with food allergies, here are a few tips when planning and taking you vacation. We made Advanced Dining Reservations (ADRs) 180 days in advance, noting on the reservations that we had food allergies. We also contacted the Special Diets dept at Walt Disney World through email. We filled out all the forms and faxed back with the ADRs listed and the food allergies in detail. Once we arrived at the restaurant, we made sure the Hostess had a note we had food allergies and which one they were. When we were seated, we mentioned the food allergies to our server who went to get the chef. The chef went over what he could have and let Kevin, our son, decide what he wanted to eat. If we had questions on any product, they would bring us out the ingredient label. Also….the chef should be the one delivering the food allergy safe food, so that there is no cross contamination or mix up. The chef also came out periodically to check on us to make sure everything was ok. 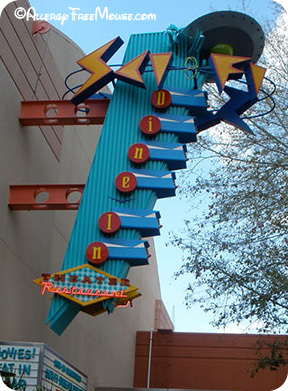 Thank you, Tara, for submitting this fabulous food allergy dining review of the Sci-Fi Dine-In Theater restaurant in the Disney’s Hollywood Studios. You can read more about her experience on her blog at The Wolfe Pack. If you found this helpful, please be sure to give her a thumbs up and/or share this on Facebook. We are thrilled to have Danielle provide this guest review of her dining experience. I want to share my favorite dining experience at Disneyworld, the Backlot Express! Backlot Express is located in Hollywood Studios. 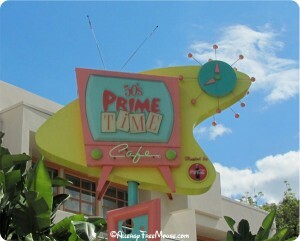 I went to this place many times during my trip in the Spring of 2010 because I enjoyed the food and service so much. The manager was well aware of food allergies and took my milk allergy very seriously. He personally served me my meal, even though the restaurant is a grab-and-go type of restaurant. I ordered the chicken tenderloins (which were free of the top 8 allergens) and french fries. They both tasted great! He allowed me to read all labels, and told me the chicken tenders and fries were fried in a separate fryer apart from the allergen containing fryer. I thought that was great that they were so knowledgeable. I suggest going before the rush gets there, because the lines can be very long and meals get prepared quick as possible during these times, leaving more room for error. I felt very confident and safe eating at the Backlot Express, and would recommend it to anyone who has one or more of the top 8 food allergies. 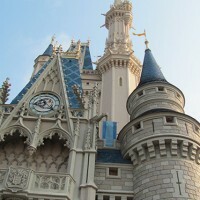 It is also affordable and my food was prepared quick so we could go ride the rides and enjoy Disney World. Thanks, Danielle, for submitting this review of the Backlot Express in Disney’s Hollywood Studios. If you found this useful, please be sure to give her a thumbs up or share this on Facebook. Guest blogging contest – round 2! 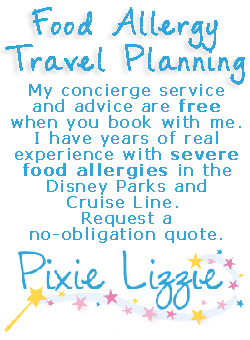 Have experience with food allergies at Disney? We’re giving another one away! We’re looking for other families and individuals to share their Disney food allergy dining experience. Our readers need much more than a simple restaurant rating. They are seeking restaurant reviews with recommendations and advice suited to their food allergy or allergies. As an incentive for your contribution, we’re going to award a $100 gift card to the Disney store to one blogger every quarter. Your submission must be a Disney dining experience, either in a table service, quick service or resort restaurant, within the past 2 years. Disneyland and Disney Cruise dining experiences count, too! Check out the latest Guest Reviews for the content! Who served you and the chef or manager’s name, if possible. Most importantly, tips that made your experience successful, as well as tips for next time. Your Author information – how you want to be credited. Your web address, or anything else you would like to promote, within reason. Feel free to include as much detail as you would like — we prefer a minimum of 3 paragraphs. Please be sure to write the article as if you were explaining your dining experience to someone, so they can fully envision the event. Include some detail about the restaurant, time of day, crowd level or anything else that adds to the enjoyment of the event as well as your food allergy details. Send your reviews in a Microsoft Word, Apple Pages, Google Docs or plain text format. Photos should be in JPG or PNG format. We’re looking for personal, detailed reviews with tips and advice. To pick the winner, we will let our readers judge the posts. We use a thumbs-up rating system for our content and will use this, plus Facebook Likes to count votes. Therefore, we encourage you to invite your readers, friends and families to our website, so they can help us all spread the word. Think of all the kids and parents you’ll help by sharing your experiences and tips. You may submit as many times as you like, as long as they are for separate restaurants. We’ll tally the votes on August 4, 2012 at 12:00PM EST and deliver the prize within a week. In the case of a tie, we will award the prize to the article submitted first. This quarter’s contest starts May 5 23, 2012 at 1:00PM EST and ends August 4, 2012 at 12:00PM EST. Open only to persons 18 years of age or older as of the date of entry. Void where prohibited and is subject to all applicable federal, state, provincial, and local laws. 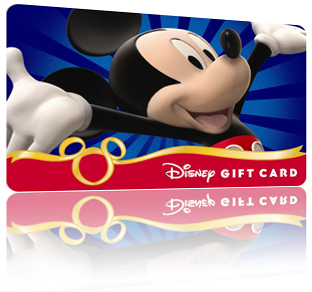 Delivery of Disney Gift Card will occur via U.S. mail. We are not responsible for shipping eligibility from the online Disney Store. 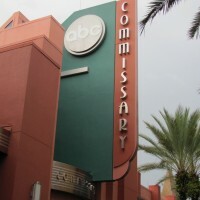 Make sure you live in a location available for DisneyStore.com shipping. They ship to most places on Earth. Winner will be notified via the email used for article submission. Be sure to provide your valid email with your article. You will also be notified when your article is published. Your article must be your own and it must be original, about dining at Disney with one or more food allergies. All articles become property of AllergyFreeMouse.com with attribution to the author, as provided by the author. We reserve the right to publish or remove the article as we feel necessary. We are not responsible for articles lost “in the email” and will confirm receipt of all entries within 24 hours. Therefore, if you do not receive acknowledgement of receipt, please email us again or use our contact form for confirmation.